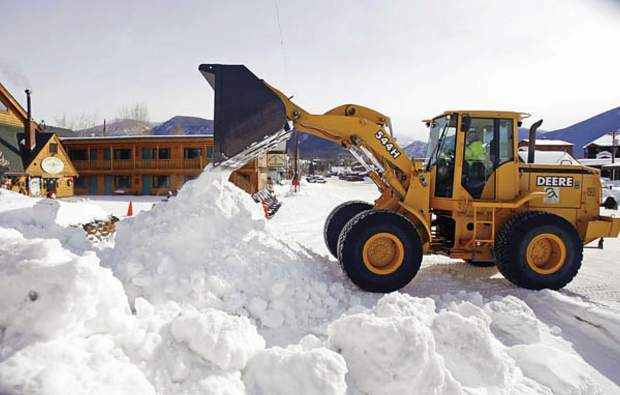 A heavy equipment operator removes snow from the streets of Grand Lake. Snow is a fundamental part of life when you live in Grand County and while many locals know first-hand how difficult it is to keep sidewalks and driveways cleared, many may be unaware of the work that goes into keeping streets, county roads and highways safe for winter travel. From Berthoud Pass to the streets of Granby, winter is the busy season for snowplow operators and the men and women who drive the heavy equipment that keeps traffic flowing. The major highways through Grand County are the responsibility of Colorado’s Department of Transportation; CDOT maintains plow stations on both sides of Berthoud Pass and at various locations throughout the county. Grand County’s Road and Bridge Department handles a little over 700 miles worth of county roads in Middle Park and, according to department supervisor, Chris Baer, the county’s 30 equipment operators plow all 700 miles. Plowing operations for the county, and its various towns, rely heavily on weather forecasts with much of the work dependent on the time that snow begins falling. South of Red Dirt Hill the Fraser Public Works department relies on a low-tech system to provide an early warning to plow operators. Nordin said Fraser is well-staffed to handle up to two feet of fresh snow over a 24-hour period, but said that higher rates of snowfall can be more challenging, given the town’s available resources. Prioritizing specific roads is a major part of the process for towns like Fraser, Winter Park and Granby, where limited resources and safety requirements often dictate the length of time equipment operators will work. The various departments noted that 12-hour work days are not uncommon for plow operators during the winter season. For Fraser, Winter Park and Granby, route prioritization revolves around major thoroughfares and high traffic areas with a special eye towards the roads around public schools. For crews in Winter Park and Fraser, there is an added emphasis on keeping Lift Bus routes clear, as well.